A knife is a practical and versatile tool used for a variety of purposes. It can be used as a tool, as a utensil and as a weapon. Although the blade of the knife is commonly made of stainless steel and is extremely hard and durable, even the toughest quality knifes become blunt over time. A damaged, dull blade is practically useless. If you want to continue using your knife, learn how to sharpen the blade properly. Learn different ways to sharpen a knife. Take a sharpening steel tool and hold it in your left hand (if you are right handed). 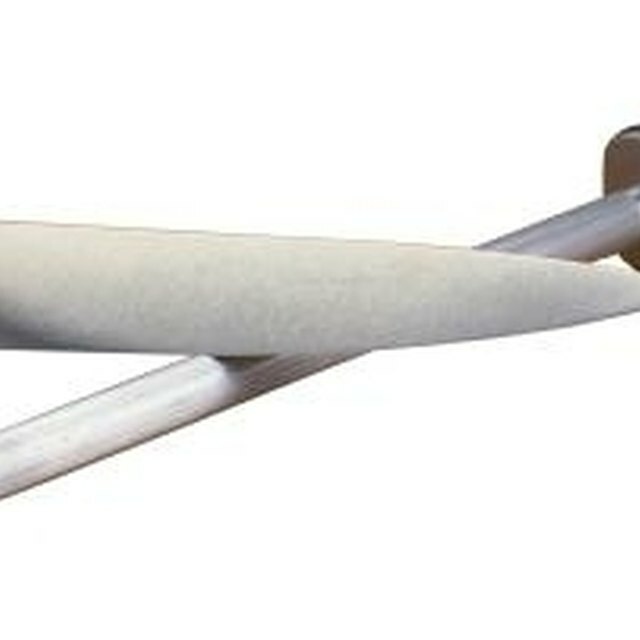 Sharpening steel is a round or flat metal rod with a handle. Take the knife in your right hand and hold it firmly by the handle. It is best that you wear thick working gloves to protect your hands from cuts. Draw the knife across the sharpening steel carefully, making sure that the angle between the knife and sharpening steel is about 15 to 20 degrees. Move the knife down the steel so that it looks as if the tip of the blade is drawing an arc. Repeat Step 3 with the other side of the knife blade. Alternate sharpening each side of the knife blade for about two minutes total, or for 20 to 25 strokes per side. Place the sharpening stone on an even, stable surface. You can also [use a sharpening stone](https://homesteady.com/how-4550408-use-sharpening-stone.html) that has three levels of sharpening textures, in which case you should always start sharpening from the toughest side. Slide the knife over the coarse side of the sharpening stone. Apply medium pressure on the knife while you slide the knife across the sharpening stone. Again, describe a slight arc with the tip of the blade. Make sure that the angle between the stone and the blade is about 20 degrees. It takes around 30 to 40 strokes on the sharpening stone to sharpen one side of the knife blade. Repeat Step 2 to sharpen the other side of the blade. Check the sharpness of the knife blade after sharpening it. Be extremely careful while doing this and follow safety precautions. Hold a paper vertically and try to cut through it, from top to bottom. The knife blade should go through the paper smoothly and make a clean cut. Instead of using a sharpening steel rod or a sharpening stone, you can use a commercial knife sharpener. You only need to slide the blade through the sharpener slit a few times and that's it. Be very careful when working with blades, whether sharp or not. Always use thick gloves and always move the blade away from your body.